Born in 1988 in the Pyrénées-Atlantiques, Benjamin Bobenrieth-Amondarain is passionate about electric bass and current music such as Rock and Funk. At the age of 15, he fell in love with the music of Django Reinhardt, he began playing guitar and began learning gipsy music. This is how he gets his first training: Swing Tribu. The group has a fairly rapid success and regularly performs in the South-West (winner of the Jazz springboard in Oloron, Pau Exhibition Center, Jazz Festival in Orthez …). In 2007, he joined the jazz musicology class at Toulouse II Le Mirail University. He obtained his jazz degree and continued his studies with a Master in Musicology, diploma he obtained with the mention “very good”. Parallel to his studies, he joined the group Oihana Quartet (with Théo Gjini, Youenn Rohaut and Rémi Bouyssière). The band received the “best group” prize at the Niglo international guitar competition (jury: Steeve Laffont, Christian Escoudé). At the end of 2010, the band recorded their first studio album under the direction of Serge Faubert. 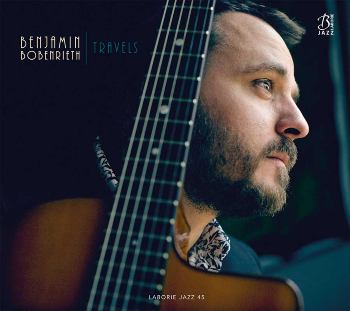 The album, entitled “Fausse Route”, is hailed by critics (Jazz Magazine, Djangostation …). Oihana Quartet performs regularly in jazz clubs and on prestigious stages (Jazz In Paris festival, Jazz Festival of Tournai in Belgium, Fetival Des rives et des notes, Niglo Festival, Novela Festival, Le Baisé Salé, The Mandala, La Tavern of Cluny …). The group is the first part of Biréli Lagrenne in 2012 in Paris. In 2013, with the guitarist Hadrien Vejsel, he formed the trio Indigo Project, a trio that regularly performs on the stages of the Toulouse region (La Novela Toulouse festival, Terre de Jazz Festival …). In conjunction with his activities as a musician, he wrote at the end of 2013 an article on Django Reinhardt in “Les cahiers du jazz” (Beyond Measure editions) and publishes a collection of scores and transcriptions of the orchestral pieces of Django’s Music at the University Presses of Mirail. In 2015, he finally formed his own trio of gypsy jazz, the Big Ben Trio (with Samuel De Zaldua and Vincent Hemery). In 2016, the Big Ben Trio records its first album with guest singer Clémence Lagier! The group is very successful and has been performing since 2015 in numerous festivals (Jazz Éclats Festival of Limoges Enamel, Jazz at the Mercure in Toulouse, Jazz in Oloron, Jazz in March in Tarnos, Jazz in Saint Sat ’, Festival Musique en Chemin , Swing Mirepoix Festival, Karavan Festival, Gipsy Jazz Festival, Jazz Festival in Comminges, Clari Jazz Festival …) as well as in the halls and clubs of the great South West and France! Together with the Big Ben Trio, he participates and plays with many groups of the Toulouse scene and elsewhere (Grain of Swing, MaDame, Sara Longo …), he also joins in 2018 the band Swing Manouche Sheik Of Swing ( with Clément Salles, Sylvain Peyrieres and Vincent Hemery).